What started as a short crime humor e-book is now making a real-world impact. Last month, I published Maynard Soloman & the Bull$hit Cancer Awareness Campaign, the seventh installment in a series of satirical crime capers. That led to a guest blog post, which morphed into an article for an online newspaper about "pinkwashing." The article wound up being distributed to a pile of other online newspapers in Minnesota. The article was critical of Mike's Hard Pink Lemonade, and attracted the attention of the Mike's corporate office. Imagine my surprise when a public relations representative got in touch with me this week. Here's the skinny. Mike's may be reworking its marketing of Hard Pink Lemonade because of the article and my correspondence with its representative. We won't know for sure until this seasonal product is released again next year. But the response from Mike's was encouraging. The Mike's Hard Pink Lemonade packaging sports pink ribbons associated with breast cancer charities. The wording on the six-pack image above states that Mike's, "will be making a contribution to the Breast Cancer Research Foundation." However, the packaging doesn't say if that means a portion of the purchase or a lump sum. The Web page Mike's set up for this product doesn't make it clear, either. My beef with this is that consumers assume purchasing products with pink ribbons on them means a portion of the sale will be donated to charity. To me, the obscurity of donation information coupled with the marketing power of pink ribbons is suspicious. Could Mike's be exploited the charitable goodwill of consumers to drive sales? * Mike's donates a lump sum of $250,000 annually to the Breast Cancer Research Foundation, for a total of $750,000 to date. * The initiative was started after an employee, Jacqueline S., died from breast cancer. * If I'd like to try some Mike's Hard Pink Lemonade, I could have a free sample shipment sent to me. Thank you for reaching out to me and clarifying the way Mike's Hard Lemonade makes donations to the Breast Cancer Research Foundation. However, I remain critical of how difficult this information is to obtain. Donation specifics are not listed on the packaging of Mike's Hard Pink Lemonade or at the front-facing Web page for the product at http://www.mikeshard.com/pinklemonade. Why should it take communication with the public relations arm of Mike's Hard Lemonade in order to find donation specifics? These specifics matter, because consumers have a certain perception about purchasing products with pink ribbons on them. They assume a portion of their purchase benefits a breast cancer-related charity. This perception is explicit in the consumer feedback Mike's itself lists at http://www.mikeshard.com/pinklemonade. On the contrary, your message to me indicates zero percent of purchases benefit the BCRF. Mike's donated a lump sum, then put a pink ribbon on its product. To me, this isn't being transparent or ethical. It's my hope that Mike's will re-evaluate the way it markets this product. Either be upfront about where purchases go, or be content internally that the unfortunate passing of an employee is memorialized every year with a donation. As I stated in my article, I don't have a problem with companies donating to charity. It's good for non-profit and for-profit businesses alike. But I do expect transparency so consumers can make educated purchases. I appreciate your offer to sample Mike's Hard Pink Lemonade, but I will have to pass. Here's where it gets good. The Mike's rep seemed to take these comments seriously. In so many words, the rep replied that Mike's may make changes in the future about how it promotes its donations. I count this as a win. Mike's got the message, and I get the impression it's going to do something about it. The rep appeared genuine in thanking me for bringing these issues up. This is the furthest I could've taken it with this company. I wouldn't expect the rep to make a solid commitment to an average Joe like me. Nor would I expect an alcohol manufacturer to recognize the cognitive dissonance required for it to get behind a health cause and pull its product. But I've been working in journalism enough to read between the PR lines. This made an impact. We'll have to wait a bit to see, though. Mike's Hard Pink Lemonade is a seasonal product. Will Mike's be more upfront about its cause marketing? Time will tell. There's a growing skepticism among consumers about "pink" products. I've been contacted privately by many individuals who feel this way. The more your company can be upfront about donations, the better response from consumers you'll likely see in the future. In other words, "Consumers are wisening up and you're going to catch hell soon if you don't change." I'm no slash-and-burn, shut-'em-down kind of guy, though. I believe in the power of dollars. I gave Mike's a financial incentive to be more transparent. If it doesn't, consumers will. That's how it works. And that's the story of how a fictional detective made a real-world impact. Coming to a liquor store near you. 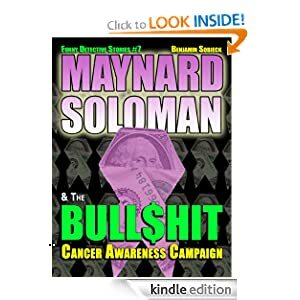 You can show your support for this haphazard activism by purchasing Maynard Soloman & the Bull$hit Cancer Awareness Campaign for the Kindle. Full disclosure: One hundred percent of the proceeds benefit me. But hey, at least I'm being upfront about it, right?